Rambus DPA Resistant Hardware Cores, when integrated into an SoC, prevent against the leakage of secret cryptographic key material through attacks. These superior performance cores are easy to integrate into SoCs and FPGAs, providing robust side-channel resistance across different security and performance levels. Our DPA Resistant Hardware Cores support industry standard cryptographic algorithms and random number generators such as: AES, TDES, SHA-2, HMAC, RSA and ECC across multiple operating modes. 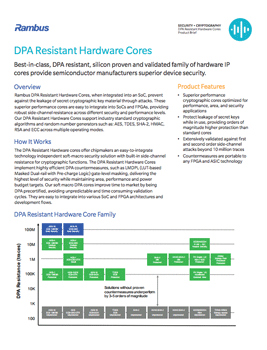 Learn more about our DPA Resistant Hardware Cores, and how it provides chipmakers with a seamless solution that enables them to devote resources to differentiating features and reduce implementation time.